Is Ross H. Schwalm’s Great Grandfather. 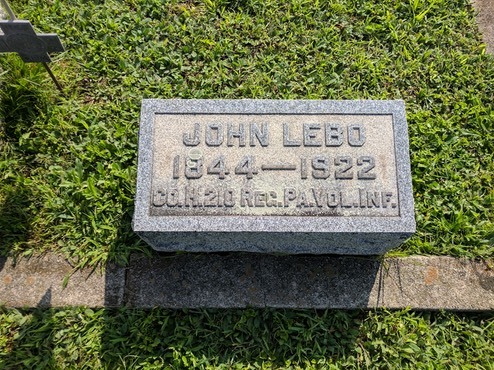 John Lebo enlisted on September 14, 1864 for one year. Enlistment papers said he was 20, 5’5” height, grey eyes, light complexion, light hair and his occupation was a laborer. He mustered at Camp Curtin for initial training. The Regiment went to Petersburg, Virginia in September 1864. They fought in several battles and were present for the surrender at Appomattox. The Army discharged John on May 30, 1965. John married Sarah Ann Rowe in 1870 and fathered 8 children. He ran a hotel in the vicinity of Reinerton, Pennsylvania. He was a member of the Grand Army of the Republic and may have belonged to GAR Post 174 William Thompson in Tower City and GAR Post 232 Heilner in Lykens. John received a Civil War Pension from 1887 – 1922. He died on December 26, 1922 at age 78. 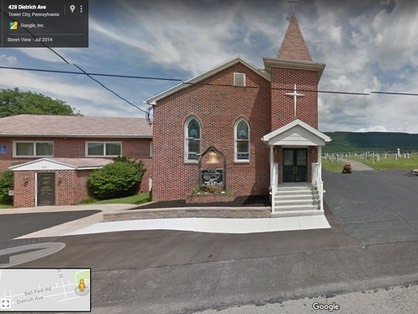 He is buried at St. Peter’s Lutheran and Reformed Cemetery at Orwin, Pennsylvania. Sara Ann received a widow’s pension until her passing in 1927. Click here to see Private Lebo’s Muster and Discharge.